Disney Babies Blog: Missed my Favorite – Move it! Shake it! Our most recent trip was a short trip – only 3 days at WDW (normally we spend 4, but this one felt so much faster), we did things very differently than our usual low-crowd level trips. Instead of visiting each park, we did Magic Kingdom twice and EPCOT once. I honestly don’t think we even park hopped! The extra time in the Magic Kingdom allowed us to ride almost every attraction – and some multiple times (Noah rode Splash Mountain at least 4 times and Big Thunder 2 or 3!). Even with our two Magic Kingdom days, we spent so much time in the back of the park that we spent hardly any time on Main Street, U.S.A. or in the hub. Only on the way in and out of the park did we really see it at all – no shopping time, no singing and dancing. We did get a few second to see the Dapper Dans as we entered the park one morning, but we didn't get to see a full set. We never saw the Characters of Main Street. We never saw the Saxophone Four. BUT – missing all of that is one thing – experiences that are special and make me smile just thinking about them. But, one that makes me want to jump on my feet and go every time that we missed? The Move It, Shake It, Celebrate It! Street Party. I know, I know. It’s cheesy. It’s silly. It seem so happen every 20 minutes. BUT, I LOVE IT!!! We find it on youtube, pull it up on D-Cot, look at picture, sing along, and dance. 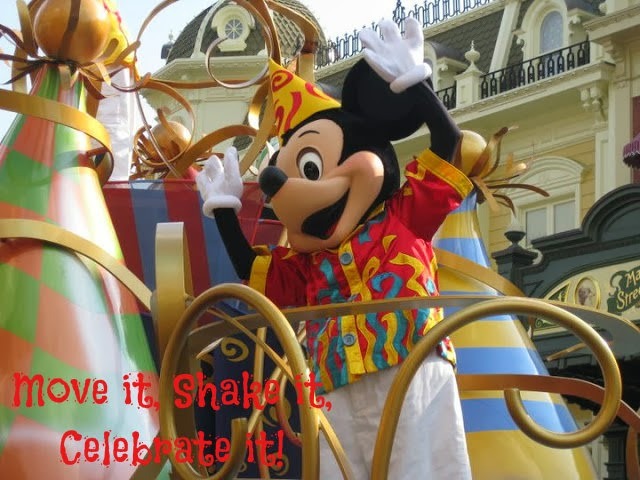 The Move it, Shake it, Celebrate it! Street Party occurs daily in the Magic Kingdom - usually 3 times per day. The schedule for today, for example, has it at 11:15, 2:45, and 4:20. I mean, they REALLY make it hard to miss, yet somehow, I missed it! Luckily, I saw it in February and I WILL see it again next year, assuming they won't get rid of my favorite party! If you're headed to Walt Disney World soon, try to find your way to the Hub (the area near the Partner's statue in front of the Castle) during one of those times of day and dance, sing, and celebrate! Need help planning? Let me help you! Book now for a $50 gift card, Get Down to Disness Planning book and folder, a Disney Guru bag, lanyards, free itinerary planning, and so much more! The Saxophone Four! Never heard of them, will have to hang out on Main Street some more in May! I love Move it! I will jump in and dance (if you can call what I do dancing) and just hope no one takes a photo! So much fun. Having kids the same age you may relate - I have literally memorized this parade and most dance moves as this is the time Little Man would fall asleep in his stroller. I would just let him sleep and watch the parade.